Sir Paul McCartney Pays Tribute To George Martin: "He Was Like A Second Father To Me"
The star has posted a heartfelt tribute to the "fifth Beatle" on his official website. Sir Paul McCartney has posted a heartfelt tribute to George Martin, following the news of his passing. 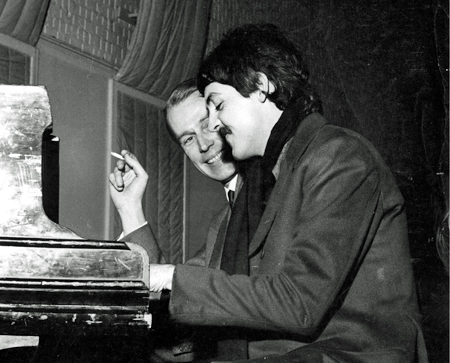 The Yesterday singer has called The Beatles producer "a true gentleman" and said he was like a "second father" to him. The singer went on to share his fond memories of the man regarded as the "fifth Beatle" in his lengthy and touching post. "I’m so sad to hear the news of the passing of dear George Martin. I have so many wonderful memories of this great man that will be with me forever. He was a true gentleman and like a second father to me. He guided the career of The Beatles with such skill and good humour that he became a true friend to me and my family. If anyone earned the title of the fifth Beatle it was George. From the day that he gave The Beatles our first recording contract, to the last time I saw him, he was the most generous, intelligent and musical person I’ve ever had the pleasure to know. "It’s hard to choose favourite memories of my time with George, there are so many but one that comes to mind was the time I brought the song 'Yesterday’ to a recording session and the guys in the band suggested that I sang it solo and accompany myself on guitar. After I had done this George Martin said to me, "Paul I have an idea of putting a string quartet on the record". I said, “Oh no George, we are a rock and roll band and I don’t think it’s a good idea”. With the gentle bedside manner of a great producer he said to me, "Let us try it and if it doesn’t work we won’t use it and we’ll go with your solo version". I agreed to this and went round to his house the next day to work on the arrangement. "He took my chords that I showed him and spread the notes out across the piano, putting the cello in the low octave and the first violin in a high octave and gave me my first lesson in how strings were voiced for a quartet. When we recorded the string quartet at Abbey Road, it was so thrilling to know his idea was so correct that I went round telling people about it for weeks. His idea obviously worked because the song subsequently became one of the most recorded songs ever with versions by Frank Sinatra, Elvis Presley, Ray Charles, Marvin Gaye and thousands more. "This is just one of the many memories I have of George who went on to help me with arrangements on 'Eleanor Rigby', 'Live and Let Die' and many other songs of mine. "I am proud to have known such a fine gentleman with such a keen sense of humour, who had the ability to poke fun at himself. Even when he was Knighted by the Queen there was never the slightest trace of snobbery about him. "My family and I, to whom he was a dear friend, will miss him greatly and send our love to his wife Judy and their kids Giles and Lucy, and the grandkids. "The world has lost a truly great man who left an indelible mark on my soul and the history of British music. "God bless you George and all who sail in you!